You have been to Singapore if you know that building with an iconic architecture on Beach Road in Kallang—the 46-year old Golden Mile Complex. Recently, there have been discussions on whether the building should be preserved or just demolished. Will it be able to reach a golden age or will it just be a thing of the past? The Golden Mile Complex has been put up for sale since Oct 31 last year for S$800 million, after eighty percent of its owners agreed to have an en bloc sale. The tender for the sale of the building will close on Jan 30. According to its marketing agent Edmund Tie & Company (ET&Co), the Urban Redevelopment Authority (URA) has advised the potential buyers to turn it into an integrated development with a gross floor area (GFA) of 85,977.5 square metres, but subject to retaining the landmark’s main building, as well as constructing a new building next to it. It has a land area of about 1.3 hectares and is zoned for commercial use under the URA’s Master Plan 2014. Under the existing commercial zone, the property may be developed as an integrated development comprising uses such as retail, office, residential, serviced apartments and hotels. Formerly known as Wo Hup Complex, the mixed-use development Golden Mile Complex is a 16-storey high-rise commercial and residential building housing 411 shops and 500 parking spaces. The term “Golden Mile” refers to the strip of land between Nicoll Highway and Beach Road. The Singapore government planned the strip as a high-rise spine fronting Kallang Basin. It is known as Singapore’s Little Thailand, a haven for the Thai community living and working in Singapore. This is where one can eat authentic Thai food, buy Thai products, read Thai newspapers, listen to Thai music, and talk to Thai people and get to know Thai culture. There used to be Thai discos and karaoke where occasional drunken brawls and fights occurred, thereby, having a reputation as a “sleazy”place. Others saw it as a “vertical slum” in central Singapore. At present, Golden Mile has become a drop-off and depature point for long-distance buses to and from Malaysia. There are still Thai food stalls and there is still a very strong Thai culture in the place. 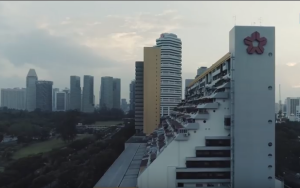 The complex was completed in 1973, with a Brutalist architectural style seen on its signature step-terraced structure designed by Singapore’s pioneering architects Gan Eng Oon, William Lim, and Tay Kheng Soon of DP Architects, formerly known as Design Partnership. to optimise the land use efficiency, but also leverage on the history of the site to bring value to the sense of place and identity of the development,” Chan Hui Min added. 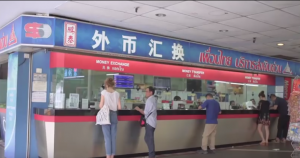 Ever since the news broke out regarding the en bloc sale of Golden Mile, the netizens have spoken up on what they believed should be done with a building that has been part of Singapore’s history. 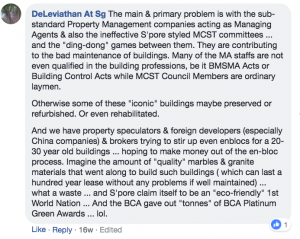 These were the comments of some netizens who wanted to have Golden Mile preserved.